We get dust storms from time to time here (though not as often as, say, in Eastern Washington, at least from the short experience I had there). Last night we had a big one, and as usual every surface is covered in dirt. While it was going on, it looked like a London fog, but with dirt instead of water. What made this one different for me is that I got to see it roll in from the south. It was an amazing sight. It looked like a scene from Steven King's the Mist, or perhaps from the bottom of a volcano slope watching a pyroclastic flow coming at you. It reminded me of standing in the streets of Manhattan on 9/11 and watching the cloud of debris coming at us after the first tower fell. 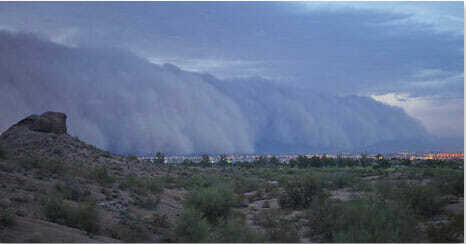 Here is a picture from the AZ Republic of the storm rolling in from the south like a giant tsunami. Here is a video of it rolling in, which is really cool, if you can ignore the end-is-near typical style of local reporting that has to blow up every odd event into a catastrophe demanding that one tune in at eleven. Lucky for you it just looked like Stephen King's "The Mist" or by now you would have been torn apart and eaten by some kind of spider-like creature from another world. Someone has been in the mummy's tomb. between your scorpions and your duststorms, you are doing well to remind me why i should stay in the mid-atlantic region despite all our statist inclinations. As a native son of Eastern Washington, you have my sympathies. In the Colombia Basin, we call those "termination winds". Supposedly it comes from the 40s when, after a big dust storm, workers at the Hanford Nuclear Site would quit, pack up, and head back East. Enjoy the storm. Hope you didn't wash your car today. The only good dust storm is one that is followed by a big enough rainfall to wash away the dirt. Last night, I only got enough sprinkle to make sure the mud was encrusted on my car. But the good news is that all the hot air blew out and today it's a balmy 75 degrees. I never remember anything quite like that when I lived there.